Don't go into the dark. 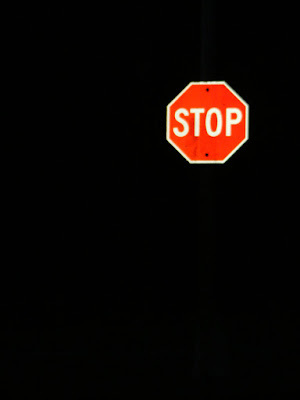 I was trying to take a picture of this stop sign because it's in front of a huge rock cliff and it looked like the oddest place to have a stop sign because duh... who's going to drive into a rock cliff but it was too dark to shoot without a flash and this is what a flash gave me. A stop sign to nowhere. I liked this better.